Because when I think Star Wars, I think… Oscorp? 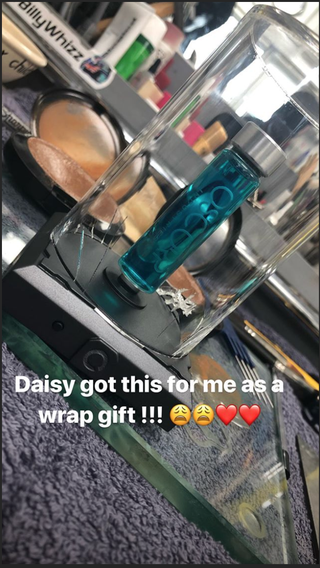 Mysteries abound on John Boyega’s Instagram, where, as Slash Film reports, he shared images of gifts he received to celebrate a momentous occasion: the wrapping of principal photography on Star Wars Episode IX. Kathleen Kennedy got him a pretty standard movie gift: a cool prop, giving him a pretty fancy blaster that looks a lot like the one Finn used in A Force Awakens. Solid. That makes perfect sense. Really cool. Daisy Ridley got him another movie prop. But a stranger one. It appears to be, so far as we and Slash Film can figure, a vial from the Oscorp Industries labs as depicted in The Amazing Spider-Man, the iteration of Spidey movies before the current era, which starred Andrew Garfield as the webslinger. Uhh. What? Why? Is Boyega, like, a big fan of that iteration of Spider-Man? Did he, as Slash Film speculates, not get a part in the films he wanted? Or is this some daft inside joke between him and Ridley? Or. Or. Maybe this is a hint. Maybe Star Wars Episode IX will be a greater crossover event than even Avengers: Infinity War. Maybe the last Jedi wasn’t Rey after all. Maybe it was someone a bit more spider-like. Or maybe not. But that’s the best I’ve got. Star Wars Episode IX comes out on December 20, 2019.